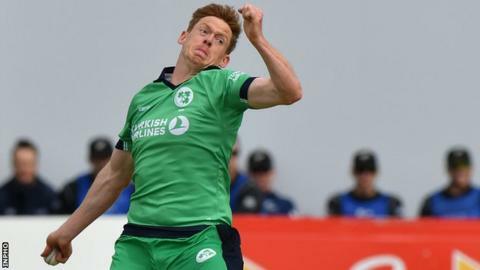 Ireland bowlers Barry McCarthy and Craig Young have been ruled out of the one-day international against West Indies at Stormont next month. McCarthy has a fractured right thumb while Young is missing because of an elbow injury. Paul Stirling and Niall O'Brien are back from injury while George Dockrell has been recalled to the squad. "It'll be a great occasion and one everybody's really looking forward to," said Irish head coach John Bracewell. West Indies clinched a thrilling Test win against England on Tuesday and they will have a strong side for the 13 September encounter. "The West Indies showed incredible character to bounce back after losing the opening Test heavily against England, and showed just how dangerous and talented a side they truly are," added Bracewell. "They will have double centurion Shai Hope in their ranks for the Belfast clash, and when you add Chris Gayle and Marlon Samuels into the mix then it's a very dangerous group of players." Ireland have a good one-day record against the West Indies, beating them in the 2015 World Cup in New Zealand as well as at Stormont in 2004. No mention of the history between the two sides would be complete without a mention of perhaps one of the most famous days in Irish history, when they skittled the West Indies for just 25 at Sion Mills in 1969. Ireland squad: William Porterfield (Warwickshire/Warriors, capt), John Anderson (Merrion/Lightning), Andrew Balbirnie (Pembroke/Lightning), Peter Chase (Malahide/Lightning), George Dockrell (Leinster/Lightning), Ed Joyce (Merrion/Lightning), Jacob Mulder (CIYMS/Knights), Tim Murtagh (Middlesex), Kevin O'Brien (Railway Union/Lightning), Niall O'Brien (Nantwich/Warriors, wk), Boyd Rankin (Warwickshire), Simi Singh (YMCA/Lightning), Paul Stirling (Middlesex), Gary Wilson (Derbyshire/Knights, wk).